New book, 48 pages, MAA489. 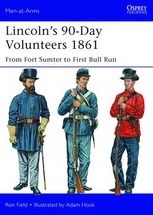 On April 15th 1861, the day after the fall of Fort Sumter, President Abraham Lincoln issued a call for 75,000 volunteers to enlist for three months' service to defend the Union. This 90-day period proved entirely unrealistic and was followed by further, and much more extensive, mobilizations. Despite this, for the first few months the defence of the Capitol depended heavily on a hastily gathered, but extremely loyal, army of militiamen and volunteers. Mostly inexperienced, poorly trained, weakly officered, and provided with motley uniforms, equipment and weapons, they bought the Union time during the vital first months. Through a wide range of period sources, this title describes and illustrates the actual appearance of this diverse and colorful force, including photographs, eyewitness accounts in period newspapers and letters, the reports of government agents, and the records of the many manufacturers who received orders to clothe and equip their state troops.